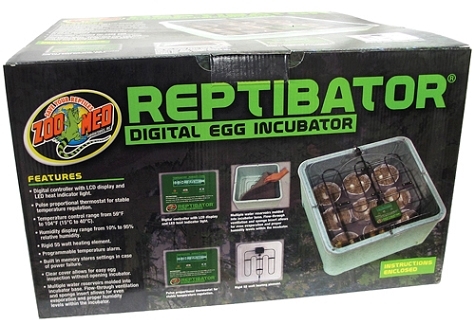 The ReptiBator® Digital Egg Incubator gives breeders complete temperature and humidity control to care for developing eggs. Additional Information: Digital controller with LCD display and LED heat indicator light. Pulse proportional thermostat for stable temperature regulation. Temperature control range from 59°F to 104°F (15°C to 40°C). Humidity Display range from 10%-95% relative humidity. Rigid 55 watt heating element. Programmable temperature alarm. Built in memory stores settings in case of power failure. Clear cover allows for easy egg inspection without opening incubator. Multiple water reservoirs molded into incubator base. Flow-through ventilation and sponge insert allows for even evaporation and proper humidity levels within incubator.